For the Indian cinema film, see August 1 (film). August 1 is the 213th day of the year(214th in leap years) in the Gregorian calendar.There are 152 days remaining until the end of the year. AD 69 – Batavian rebellion: The Batavians in Germania Inferior (Netherlands) revolt under the leadership of Gaius Julius Civilis. 527 – Justinian I becomes the sole ruler of the Byzantine Empire. 607 – Ono no Imoko is dispatched as envoy to the Sui court in China (Traditional Japanese date: July 3, 607). 902 – Taormina, the last Byzantine stronghold in Sicily, is captured by the Aghlabids army, concluding the Muslim conquest of Sicily. 1203 – Isaac II Angelos, restored Eastern Roman Emperor, declares his son Alexios IV Angelos co-emperor after pressure from the forces of the Fourth Crusade. 1291 – The Old Swiss Confederacy is formed with the signature of the Federal Charter. 1469 – Louis XI of France founds the chivalric order called the Order of Saint Michael in Amboise. 1571 – The Ottoman conquest of Cyprus is concluded, by the surrender of Famagusta. 1620 – Speedwell leaves Delfshaven to bring pilgrims to America by way of England. 1664 – Ottoman forces are defeated in the battle of Saint Gotthard by an Austrian army led by Raimondo Montecuccoli, resulting in the Peace of Vasvár. 1714 – George, Elector of Hanover, becomes King George I of Great Britain, marking the beginning of the Georgian era of British history. 1759 – Seven Years' War: The Battle of Minden, an allied Anglo-German army victory over the French. In Britain this was one of a number of events that constituted the Annus Mirabilis of 1759 and is celebrated as Minden Day by certain British Army regiments. 1774 – British scientist Joseph Priestley discovers oxygen gas, corroborating the prior discovery of this element by German-Swedish chemist Carl Wilhelm Scheele. 1798 – French Revolutionary Wars: Battle of the Nile (Battle of Aboukir Bay): Battle begins when a British fleet engages the French Revolutionary Navy fleet in an unusual night action. 1800 – The Acts of Union 1800 are passed which merge the Kingdom of Great Britain and the Kingdom of Ireland into the United Kingdom of Great Britain and Ireland. 1855 – The first ascent of Monte Rosa, the second highest summit in the Alps. 1876 – Colorado is admitted as the 38th U.S. state. 1893 – Henry Perky patents shredded wheat. 1907 – The start of the first Scout camp on Brownsea Island, the origin of the worldwide Scouting movement. 1911 – Harriet Quimby takes her pilot's test and becomes the first U.S. woman to earn an Aero Club of America aviator's certificate. 1927 – The Nanchang Uprising marks the first significant battle in the Chinese Civil War between the Kuomintang and Chinese Communist Party. This day is commemorated as the anniversary of the founding of the People's Liberation Army. 1933 – Anti-Fascist activists Bruno Tesch, Walter Möller, Karl Wolff and August Lütgens executed by the Nazi regime in Altona. 1936 – The Olympics opened in Berlin with a ceremony presided over by Adolf Hitler. 1937 – Josip Broz Tito reads the resolution "Manifesto of constitutional congress of KPH" to the constitutive congress of KPH (Croatian Communist Party) in woods near Samobor. 1943 – World War II: Operation Tidal Wave also known as "Black Sunday", was a failed American attempt to destroy Romanian oil fields. 1944 – World War II: The Warsaw Uprising against the Nazi German occupation breaks out in Warsaw, Poland. 1957 – The United States and Canada form the North American Aerospace Defense Command (NORAD). 1960 – Dahomey (later renamed Benin) declares independence from France. 1960 – Islamabad is declared the federal capital of the Government of Pakistan. 1961 – U.S. Defense Secretary Robert McNamara orders the creation of the Defense Intelligence Agency (DIA), the nation's first centralized military espionage organization. 1968 – The coronation is held of Hassanal Bolkiah, the 29th Sultan of Brunei. 1971 – The Concert for Bangladesh, organized by former Beatle George Harrison, is held at Madison Square Garden in New York City. 1974 – Cyprus dispute: The United Nations Security Council authorizes the UNFICYP to create the "Green Line", dividing Cyprus into two zones. 1980 – Vigdís Finnbogadóttir is elected President of Iceland and becomes the world's first democratically elected female head of state. 1980 – A train crash kills 18 people in County Cork, Ireland. 1981 – MTV begins broadcasting in the United States and airs its first video, "Video Killed the Radio Star" by The Buggles. 1984 – Commercial peat-cutters discover the preserved bog body of a man, called Lindow Man, at Lindow Moss, Cheshire, England. 1998 – The establishment of Muslim Medics, one of the largest student-led societies in Imperial College London that provides both academic and wellbeing support to medical students of all backgrounds. 2004 – A supermarket fire kills 396 people and injures 500 others in Asunción, Paraguay. 2007 – The I-35W Mississippi River bridge spanning the Mississippi River in Minneapolis, Minnesota, collapses during the evening rush hour, killing 13 people and injuring 145. 2008 – The Beijing–Tianjin Intercity Railway begins operation as the fastest commuter rail system in the world. 2008 – Eleven mountaineers from international expeditions died on K2, the second-highest mountain on Earth in the worst single accident in the history of K2 mountaineering. 2017 – A suicide attack on a mosque in Herat, Afghanistan kills 20 people. Year 30 BC was either a common year starting on Wednesday, Thursday or Friday or a leap year starting on Thursday of the Julian calendar and a common year starting on Wednesday of the Proleptic Julian calendar. At the time, it was known as the Year of the Consulship of Octavian and Crassus. The denomination 30 BC for this year has been used since the early medieval period, when the Anno Domini calendar era became the prevalent method in Europe for naming years. Year 10 BC was either a common year starting on Tuesday, Wednesday or Thursday or a leap year starting on Tuesday or Wednesday of the Julian calendar and a common year starting on Sunday of the Proleptic Julian calendar. At the time, it was known as the Year of the Consulship of Maximus and Antonius. The denomination 10 BC for this year has been used since the early medieval period, when the Anno Domini calendar era became the prevalent method in Europe for naming years. 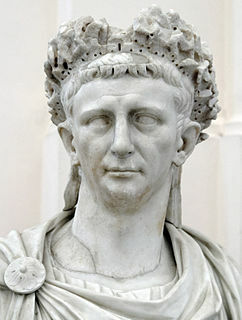 Claudius was Roman emperor from 41 to 54. A member of the Julio-Claudian dynasty, he was the son of Drusus and Antonia Minor. He was born at Lugdunum in Gaul, the first Roman Emperor to be born outside Italy. Because he was afflicted with a limp and slight deafness due to sickness at a young age, his family ostracized him and excluded him from public office until his consulship, shared with his nephew Caligula in 37. Year 126 (CXXVI) was a common year starting on Monday of the Julian calendar. At the time, it was known as the Year of the Consulship of Verus and Ambibulus. The denomination 126 for this year has been used since the early medieval period, when the Anno Domini calendar era became the prevalent method in Europe for naming years. Chantal Montellier, born on August 1, 1947, in Bouthéon near Saint-Étienne in the Loire Department, is a French comics creator and artist, editorial cartoonist, novelist, and painter. As the first female editorial cartoonist in France, she is noted for pioneering women's involvement in comic books. Avi Arad is an Israeli American businessman who became the CEO of the company Toy Biz in the 1990s and soon afterward became the chief creative officer of Marvel Entertainment, a Marvel director and the chairman, CEO and founder of Marvel Studios. Marvel Studios, LLC is an American motion picture studio based at the Walt Disney Studios in Burbank, California, and is a subsidiary of Walt Disney Studios, itself a wholly owned division of The Walt Disney Company, with film producer Kevin Feige serving as president. Previously, the studio was a subsidiary of Marvel Entertainment until Disney reorganized the companies in August 2015. 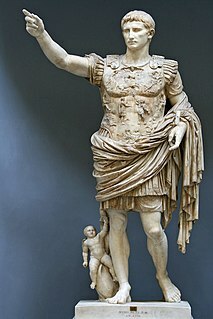 Marcus Antonius, commonly known in English as Mark Antony or Anthony, was a Roman politician and general who played a critical role in the transformation of the Roman Republic from an oligarchy into the autocratic Roman Empire. Year 371 (CCCLXXI) was a common year starting on Saturday of the Julian calendar. At the time, it was known as the Year of the Consulship of Augustus and Petronius. The denomination 371 for this year has been used since the early medieval period, when the Anno Domini calendar era became the prevalent method in Europe for naming years. Eusebius of Vercelli was an bishop from Sardinia and is counted a saint. Along with Athanasius, he affirmed the divinity of Jesus against Arianism. Earliest day on which August Bank Holiday (Ireland) can fall, while August 7 is the latest; celebrated on the first Monday of August. Earliest day on which International Beer Day can fall, while August 7 is the latest; celebrated on the first Friday of August. National Day, celebrates the independence of Benin from France in 1960. National Day, commemorates Switzerland becoming a single unit in 1291. ↑ Melaugh, Dr Martin. "CAIN: Chronology of the Conflict 1988". Cain.ulst.ac.uk. Retrieved 4 August 2017. Wikimedia Commons has media related to August 1 .